I have used the Sonax product for a few years now and it is the best product I have ever used - Auto EXPRESS's review is absolutely right. However I figure this Lidl stuff must be worth a try as it seems to be the same thing - it certainly looks like it. I have bought some and will try it out and post a verdict later. The middle one kinda looks like Mountain Due. Is this concentrated screenwash which you need to dilute with water or is it an additive added to your existing screenwash? The bottle's themselves are likely produced by a plastic's company, not Sonax, and even if Sonax had patented the bottle design it does not mean that another company would not produce a similar bottle design, depends on the patent and Sonax's willingness to uphold their patent. It is unlikely that a company like Sonax would produce a similar product for another company under a different brand in a similar bottle design that is readily associated with it's core product as this would have a knock on effect on sales of it's core, premium product. Everything suggests this is not Sonax but a cheap imitation produced by another company for Lidl to resemble a premium product that is on the Market. I've been using this for years now, it used to be around 79p, it's good screenwash. I agree it is not Sonax, I have now compared the contents. The Sonax product is much more viscous and smells stronger. So the Lild product is probably OK, but not as much of a bargain as originally thought since it is clearly not the same as the Award Winning Sonax. I imagine it's very similar. It will be a summer product and contain no anti-freeze, so you are quite correct. Been buying this stuff for years. It is brilliant for summer use. A tiny wee bit, and I mean tiny, goes a long, long way. Bottle lasts for absolutely ages. When? And on which platform? I bet the Screenwash of the year ceremony is gripping! I will try some of this, Ive been using Carplan screen wash for the past few years but keep getting blockages in the screenwash tank so I put some mixed concentrate in a container when it happened last time a few months ago, I looked at it yesterday and large pieces of white fungus are floating around in the container, so its obvious that this is what was causing the blockages, Ill be keeping clear of Carplan screenwash in future. 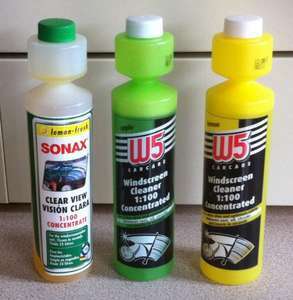 I've used this screenwash over the past three years - it is fine for use in the spring/summer. Slightly off topic - I put my car in for a service the other week and they listed Washer Jet - WORN! How on earth did the water passing thru it wear it out? Answers on a post card. Iv enever owned a car that has had worn out washers! the only problem with this stuff is when you squeeze it to the top bit it goes all foamy so cant really tell how much to use, but yeah it goes a long way..
Appears that Sonax always clean up. Is this concentrated screenwash which you need to dilute with water or is … Is this concentrated screenwash which you need to dilute with water or is it an additive added to your existing screenwash? It's the first of these - 100:1 concentration. Washer jet worn, = neadle or screw driver adjusting nozzle or quite simply second hand! the only problem with this stuff is when you squeeze it to the top bit it … the only problem with this stuff is when you squeeze it to the top bit it goes all foamy so cant really tell how much to use, but yeah it goes a long way..
Have you tried holding the bottle upright and squeezing it into the chamber first and then pouring it into the cap? worked better for me.